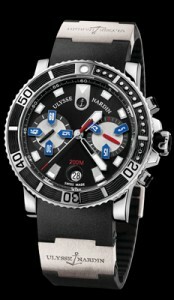 Ulysse Nardin Maxi Marine Chronograph,42.7mm, stainless steel case, with date, and automatic movement. It features an exhibition case back which reveals the rotor etched with the Ulysse Nardin name, and anchor logo. This watch comes on a black rubber strap, with two high grade titanium elements, and a titanium, folding buckle.